Let me introduce you to Patrick. Patrick will be 5 tomorrow (January 5th), and currently lives in an orphanage in Eastern Europe. 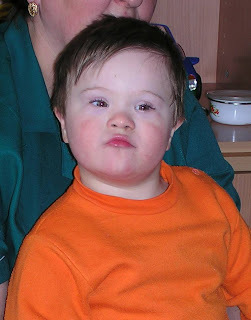 Patrick has Down Syndrome and he stole the hearts of everyone in our house the day we saw him on Reeces Rainbow http://www.reecesrainbow.com/. We are currently in the very early stages of bringing Patrick home to be part of our family. Follow along on our journey, pray with us, support us (through kind words; prayer; and if you feel lead, money). Thank you for letting us share our journey with you. We pray that this journey has a happy ending!! I totally guessed it! He's awesome!!! Praying for you sweet Lyndi. Jennifer, you know me to well!! Thanks for the prayers...we're gonna need them!! Renee, again, thank you for all of your help. You have already been so incredible.